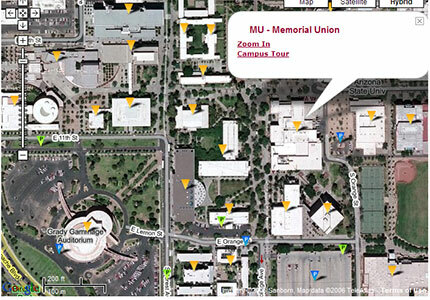 Apparently Arizona State University has a new online campus map in beta that was designed by Google. It is unsure if ASU paid Google to create this map or if it was part of a partnership with Google considering that Google is moving onto the ASU campus. It is a pretty slick Google Maps mashup that ties into their existing campus tour as well as the ASU campus locations; Tempe Main Campus, ASU West, Polytechnic campus, Downtown Phoenix campus, ASU Research Park and Skysong (where I think Google might locate permanently).